Understanding your customers is an obvious cornerstone of business. After all, how can you be sure your brand is up to the task of fulfilling client needs without a deep understanding of what it is that consumers are looking for? Here’s the tricky part, though – unless you work to drill down and focus on the type of individuals you’re selling to, your customers can quickly become a sea of faces without the benefit of common threads or any defining characteristics among them. This is where your buyer personas come in, helping you and your marketing team better understand the motivations behind purchasing decisions and the type of messaging that will appeal to your audience. I know what you’re thinking: “I already know who my customer is.” But do you really? Do you have an in-depth understanding of the things that make your customers tick, or the characteristics that identify your ideal customer? Do you know which of your customers has the highest commercial value, or which customers are influencers and which have decision-making power? These – and a range of other aspects, which we’ll take a look at shortly – are all things that your personas can tell you, and these critical insights should be used to shape the ways in which you speak to different clients at certain points in their customer journey. Your messaging is important, and you must be able to speak to your customers in a way that directly lines up with their needs and the pain points they’re looking to have solved. This is where your personas come in – they help you and your marketing team have the best understanding of the actual users of your merchandise or services, the key interests they have and what appeals to them. As Marcia Riefer Johnston pointed out for the Content Marketing Institute, some teams have the bad habit of skipping over persona creation in order to get to the meat of a project. Others may have personas available to them, but choose to – GASP! – ignore them. Once created, personas are an incredibly effective resource that will be consulted time and time again, and businesses that don’t establish their personas or ignore them do so at their own peril – Johnston noted that many of these organizations quite literally go out of business. Building personas doesn’t just mean outlining a bunch of typical customer needs that map to the services you provide. Sure, this can be helpful, but personas go much further than that by outlining the makeup of your ideal customer, and putting a name and other key details to the sea of faces that is your customer audience. In this way, when you’re creating your personas, you’re actually building out fictional characters that represent real segments of your current and potential customer audience. Name, age, location, interests and other personal, background information. Business background information, including job title, whether or not they are a decision-maker or the type of influence they might have on decision-makers. Day-in-the-life, with a first-person description from the persona themselves. This is important, as readers should begin to glean a full understanding of the persona from this perspective. Main problems. Again, it’s important to be specific. Drill down – what frustrates this persona? What stands in the way of his or her goals? Orientation toward the job. This part of the persona can be incredibly telling. For instance, a young persona who’s new to the job will require more work for awareness and education. A persona who’s been in her career for 15 years and is a confident mentor and leader, on the other hand, will require more of an authoritative tone that doesn’t talk down to her. Questions, including those that the persona will ask at different points in the customer journey, and how they relate to his or her personality and position. Content preferences. Given what we know about the persona, how does he or she like to consume content? This includes preferred channels, the tone, style and voice that will most resonate, content formats and more. Keywords, including those that align with the persona’s position within the business and the obstacles they’re trying to solve. Don’t forget to include a photo or avatar of the persona. This extra step can be incredibly helpful for your team to visualize the person they’re looking to connect with. Good old Facilities Manager Fred. In this B2B persona from Buffer, we can get a good idea of who Fred is, including that he has a wife and an undergraduate degree. 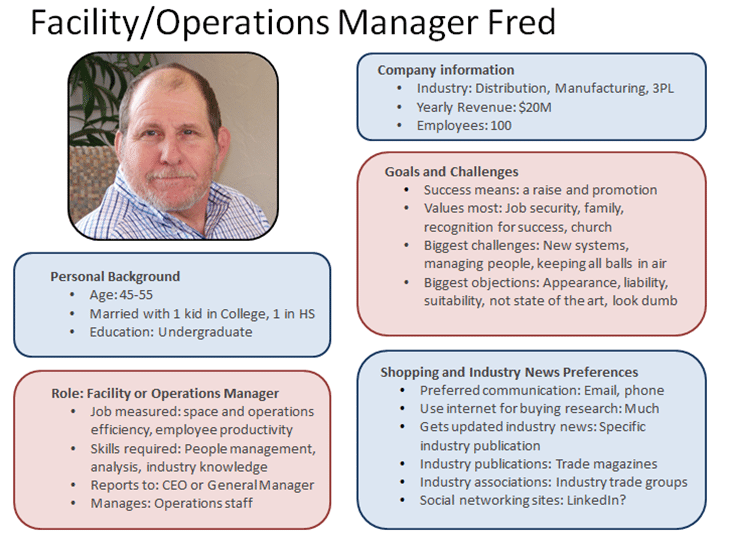 We can see the kind of role Fred has within his business, as well as details about the company itself. This persona also does a good job of outlining the goals and values Fred has, as well as the obstacles that stand in his way. However, these could be more specific and well defined – instead of just stating that Fred has difficulty “keeping all balls in the air,” the persona could go further to describe the elements associated with this struggle. Is it that Fred struggles with time management? Or that specific inefficiencies make it difficult for him to get everything done? The same goes with the listed objections: We understand that Fred doesn’t want to look dumb – nobody does! But what types of concepts worry him the most? Is he looking to be more educated about certain things? Or is it that he doesn’t like the use of industry jargon? These are all questions worth asking and answering, which can help you further drill down your messaging and overall appeal. Here we have Director Diane, another Buffer persona. Compared to Fred, Diane is much more well-rounded in her B2B persona – we can see what a day is like for her, the problems she runs into, her goals and aspirations, the experience she’s seeking when looking for products and services and more. It’s interesting here that we also have a mix of bulleted statements, as well as quotes from Diane herself within the PROBLEMS section. It’s very beneficial to let your personas speak for themselves. This little touch goes a long way toward showing the individual’s personality and can provide cues to the type of language the persona uses and what messaging might resonate with him or her. Definitely take the time to create first-person statements from your personas, but ensure that these are carefully thought out and incorporate his or her experience, pain points and motivations. This B2C persona from Munro provides a good example of the power of persona design. 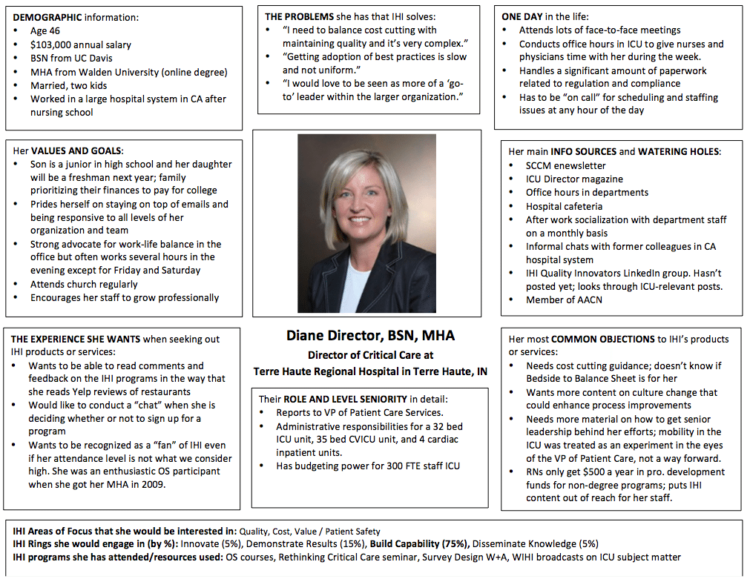 Our previous Diane example is very detailed, but the amount of information, bullet points and boxes can become overwhelming, especially for internal teams that tend to glean more value from short blurbs. In addition to its layout and design, this persona provides another interesting aspect – not only do we have a first-person quote from Brandi herself, but we can also read over quotes from this company’s actual customers. It’s important, though, that should you choose to include statements from your real buyers, that they align and bring value to the persona. There must be some type of strong connection and reason for including these quotes – otherwise you’re just splashing reviews on a page where they don’t belong. This persona also helps show the importance of ensuring your personas are well defined – the more detail, the better. Although, don’t be fooled – we can understand A LOT about Brandi from her persona here, including her experiences with shoe shopping and the channels she prefers. 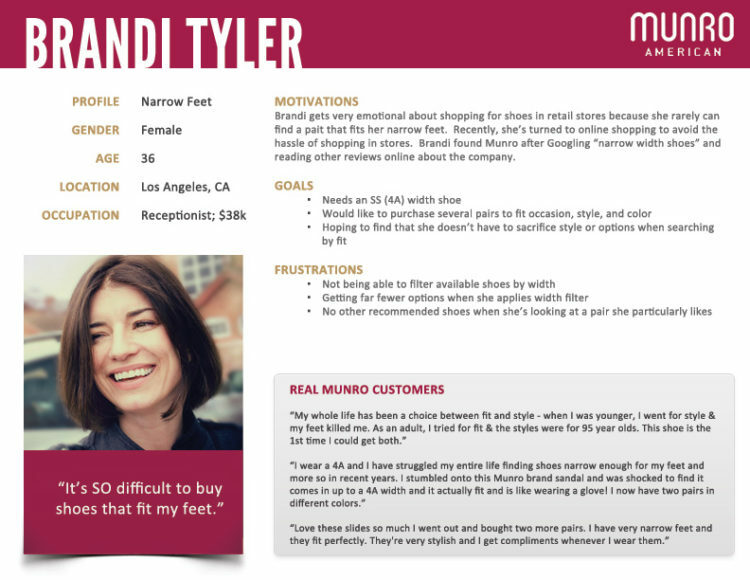 As Brandi shows, personas can be information-packed without being overly wordy. 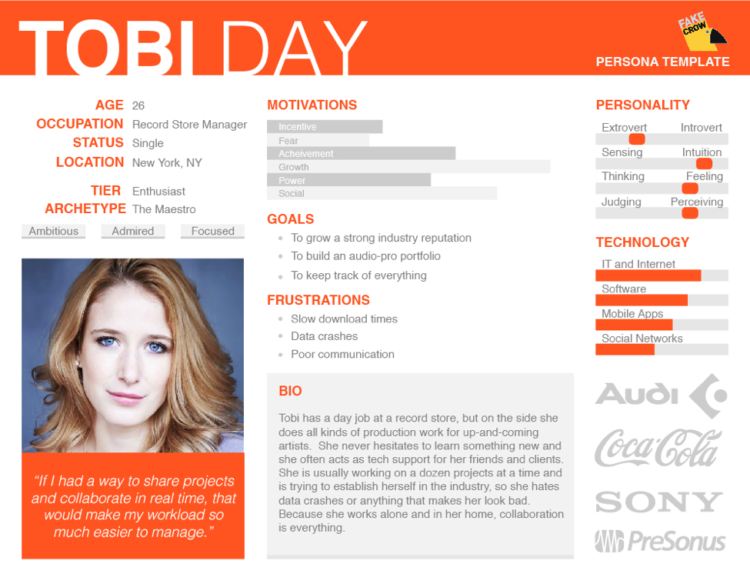 Tobi Day provides us with another example of the impact of persona design. The ways in which you convey persona information is incredibly important – this can’t be overstated. What’s particularly interesting with Tobi is the use of scales and bars to better describe her personality and how she associates with technology. This gives readers a very good idea of where Tobi stands and what’s important to her. Another key takeaway here is the use of Tier and Archetype information, followed by related traits (ambitious, admired, focused). This provides us with an even deeper understanding of the type of person Tobi is, and the ways in which she might make her purchasing decisions. Who knew that a coffee shop customer could be so well defined? Clearly Iron Springs Design did, as their Sarah Student persona provides a great case of digging deep in order to fully understand your customers. Not only do we get a glimpse into Sarah’s life, background and needs, we can also get to know her in terms of her worries and fears, hopes and dreams and what would make her life easier. Her influences and brand affinities are an important inclusion as well, as these can provide critical cues for messaging and interactions. 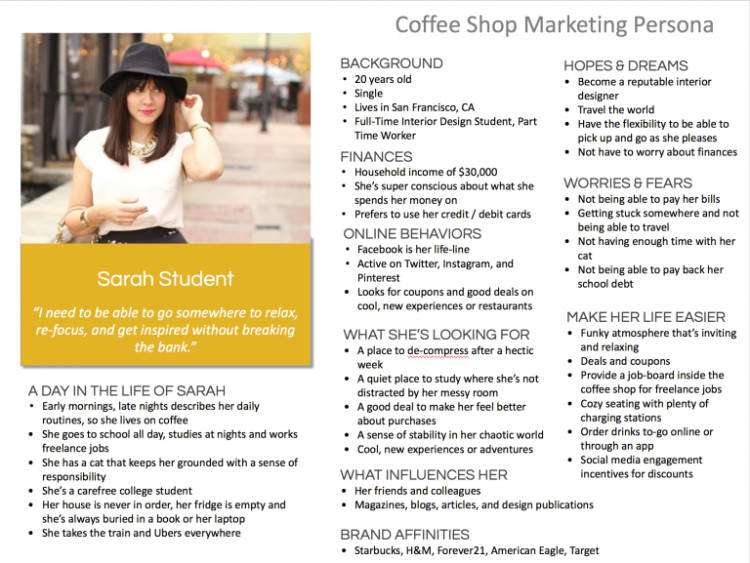 Sarah also provides an ideal example of the ways in which personas can inform a brand’s use of social media. As we can see from the “Make her life easier” section, Sarah appreciates discount incentives delivered via social media. This can be a valuable way to connect with and convert Sarah (as well as other customers like her) using her own channel preferences. Once you’ve framed your personas and fully built them out with personality details, it’s time to take things a step further. It’s important that you and your marketing team are able to use the information you know about your personas to walk them through different scenarios, and apply the resulting lessons to improve your connection with customers. A good place to start is within your current marketing campaigns. Examine your personas and the ways in which they would react to your existing marketing efforts – you might be surprised by what you learn, and it could provide the perfect opportunity to shift and improve your activities to better suit your audience segments. Your personas are a critical resource that you’ll use again and again to shape the strategies your brand uses to speak to your ideal customers. This helps us create in-depth personas that paint a true picture for our clients. Ready to create your own personas? We’ve put together this handy Persona Development Template to help you get started! Remarketing vs Retargeting: What’s the difference?